Alarm at 5:30 am or something stupid, and I struggle to get up. I want to maintain the early morning cycle, since I'll be riding soon, but today it will also be useful since LP warns that the ruins get chaotic once the buses start showing up at 7:30am. I have breakfast at the hotel, and bike to the ruins, arriving around 7am. It's quite a downhill to the ruins (watch out for the wheel-eating sewer grates!) so the climb back up to the Valentine is going to be miserable. I buy the two-day pass (26JD / $37) and enter the grounds. 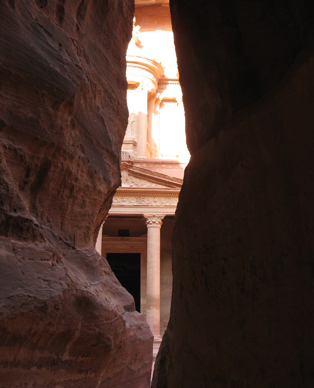 What's there to say: Petra's wondrous. After a dull dusty walk I enter a 5-meter wide, 50-100 meter high multihued canyon (Note - LP lectures that it's not a canyon, since it was not created by erosion, but rather by an earthquake. Whatever.) 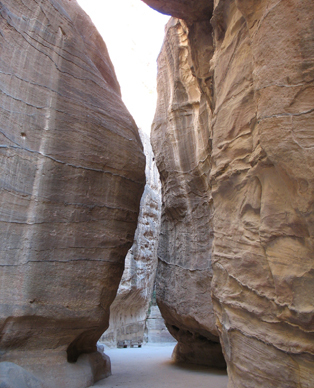 This siq leads to the most famous site, the Treasury, carved into the wall at the first large clearing. Past the Treasury the siq opens up to a landscape reminiscent of those seen in a cowboy movie. Except that caved into the rock are one after another wondrous facades: the Royal Tombs. There are Bedouin kiosks everywhere, and some seem to have old stuff beyond coins. 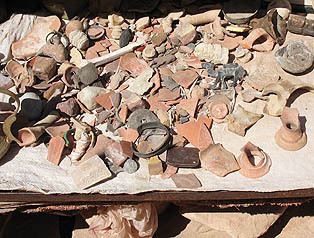 At one kiosk I spot broken shards of pottery and other odds and ends, and a small head, or part of a head. It's old, and the back's broken off, but it's beautiful. Hell - It's perfect! The woman proposes 15JD, I offer 12, she hesitates, but then agrees, and I own it. I'm thrilled! At midday I pay 5JDs for a donkey ride up the 800 steps to the monastery, since that walk doesn't sound like that much fun. The monastery's OK, but not worth 800 steps. At least to someone that got to Petra on a bicycle. The Crown Plaza runs a very nice restaurant with the 10JD all you can eat lunch buffet. I skip the buffet, but it seems to be one of the better deals in Jordan. Taking a break from the afternoon heat, I tuck myself in the shadows of the columns of the Southern Temple, and actually doze for a few minutes, tunes playing on the MP3. It feels very decadent. I continue my wanderings. 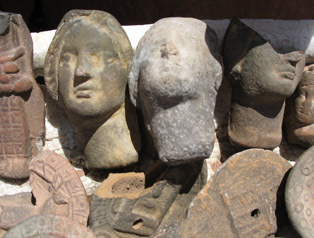 Stopping by another Bedouin kiosk, I spot four more of my genuine antique heads. Damn! In the late afternoon, exhausted, I work myself back to the entrance. There's a tent setup with a big banner "Vote For Petra," and a row of 15 PCs-apparently there for the using. A sign explains further: New7Wonders.com, is having a contest to identify-you guessed it-the seven wonders of the new world. Petra's one of the choices, and Petra's marketing department has apparently decided that they'd like to make it easy for visitors to vote for them. Frankly, My first thought is how inappropriate some of the selections seem to be. The Statue of Liberty? The Sidney Opera House? Sort of embarrassing company for the real wonders like Angkor Watt and Petra. Oh well. It's too bad that Petra can't just ignore this travesty of cultural relevance. As I start walking up the street a taxi offers a ride. I pass on the 3JD offer, but accept the 2JD proposal, wedging the bike in the trunk. Back in the neighborhood, I visit an ATM, buy a few groceries, and back up the camera's memory into a CD for 1.5JD (the first real bargain I've found). Have thee dinner buffet at the hotel, watch half a movie in the lounge, and am asleep by 9:30. Entering the siq is pretty special. The famous Treasury, just around the bend. 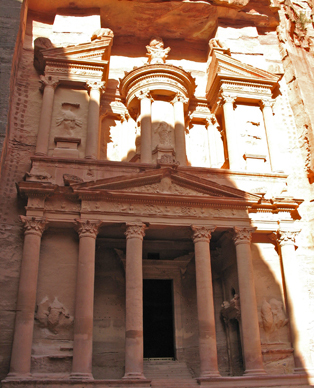 Petra's Treasury, aka Al-Khazneh, carved into the cliffs. Later in the day I spot heads identical to the unique head I had bought.